Today, June 29, 2007, promises to be an interesting day. I am staying outside of Curraghboy, a small village northeast of Athlone, at my all-time favorite B&B; St. Ruth’s Farmhouse. I drove on into Ballinasloe and stopped at the Tourist Centre. I have the briefest of information on a “St. Grellan’s Well in Ballinasloe” and a notation that says it is also called Tobergrellan. How fortuitous it was to stop in the tourist office because the young woman at the desk, Susan Finnerty, knows the well. In fact, it is on her family’s property and the townland is called Tobergrellan. As she was presently working, I agreed to meet her later in the afternoon and at that time she guided me out to the well. On my way back into town I stopped into Crumbs and Cream Tea Shop and had fantastic, warm, chocolate cake with cream and tea. Wonderful! 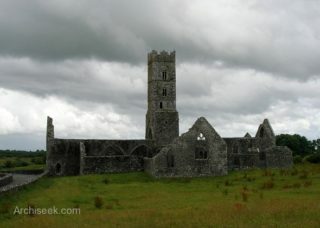 I travelled on and stopped at Kilconnell Friary, now a ruin, a Franciscan house founded in 1353. 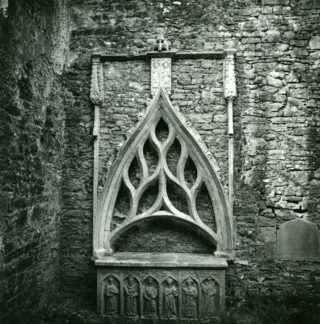 I photographed some beautifully carved tombs from the late 15th or 16th century. One tomb was particularly amazing. A nearby plaque informs the visitor of the history of the religious community and its architecture, including the lovely, very tall, bell tower. This is a site that I believe is largely forgotten. Next I headed for Woodlawn. It is now around 3:30 pm and I have managed to travel very few miles from my B&B. But the experience has been rich and it was to become even more so. I had some brief information about the area and knew that it is named for an estate, Woodlawn House, which is now uninhabitable. But my real interest here are the two holy wells about which I have a bit of information. 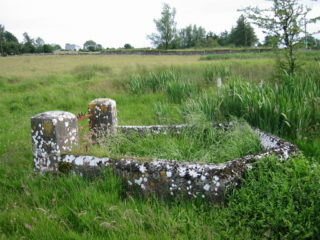 Maire MacNeill’s scholarly book entitled Festival of Lughnasa; A Study of the Survival of the Celtic Festival of the Beginning of Harvest, Oxford University, 1962, indicates that two holy wells existed nearby and I began looking for local people who might be able to help me with their exact locations. I stopped at a house where two English people, Daniel and Carrie Attwood, invited me in for tea and conversation. On hearing of my interest in holy wells, they phoned a postman friend who was born in the area and is involved in local history; he is Celsus Sheridan. Celsus came by and was very interested in reading my textual information; he thinks he knows the location of the wells. The one called Tobar a’Domhnaigh (Toberdoney) is in Cross – Benbeg and Ballyfa is also mentioned in the descriptive information. He showed me the approximate location on my map. The other well is outside a graveyard called Killaan. He knows the graveyard but doesn’t know exactly where the well might be. He seems excited about the prospect of helping me locate the well and wants to go with me and have a look. Celsus is one of fourteen children and his father was the local postman; Celsus has done this job himself for 27 years. Of course he knows everyone. I liked him right away. He explained the interesting story of how he got his rather unusual name. It seems a parish priest, who was visiting Celsus’ mother when she was in the hospital, was lamenting the fact that he would have no one to remember him and nothing to leave to posterity after he dies. In their conversation the priest asked her if she would name this new baby Celsus, after him. And she did. The power of the priest — in days gone by. Tobar Leadhain, Woodlawn, Co. Galway, B. Kilconnell, P. Killaan, T. Killaan, D. Clonfert, OS Galway 86. M63. 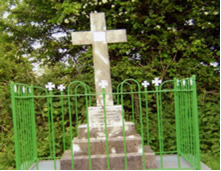 When O’Donovan was engaged on the Ordnance Survey in 1838 he found that a patron used to be held at Tobar Leadhain near the old church on Garland Sunday, also called Domhnach na bhFear or Domhnach Chrom Dubh, in honour of St. Laan, the patron of the church. Summary: Well near old parish-church site of patron on Garland Sunday, also called Domhnach na bhFear and Domhnach Chrom Dubh. Associated person: St. Laan (Leadhan), who is identified with Laeban (Loiban), St. Patrick’s smith. Source: OSL Galway I (1838), 606. After a bit of good-natured chatting Celsus and I said good-by and I drove off to try to find the other well. Celsus’ marking of my map came in handy. I had a bit of difficulty getting the right field, but I finally found the well and climbed over the barbed wire fence to get to it. I am amazed to see that this well still exists although in a bit of a dilapidated condition, but still is identifiable. Tobar a’Domhnaigh (Toberdoney), Co. Galway, B. Loughrea, P. Grange, T. Benbeg, D. Clonfert. OS Galway 97. M 62. Some three miles south of Woodlawn by the road to Loughrea is a hill called Coraun. Near here is the holy well. A patron used to be held here on the last Sunday of July. It is remembered that there were horse-races and faction-fights at it. This place must be near the Crossmacrin (Cros Moighe Croind) of which O’Donovan said, writing in 1838, that a patron had been held there annually on Garland Sunday some years back. O’Donovan reported that the patron was held at a cross, but did not say that he saw the cross. Tradition did not remember the name of the saint in whose honour the patron was held. Four townlands meet at Toberdoney, of which one is called Cross. Summary: Patron held at well on Garland Sunday formerly, House-races, and faction-fighting. Sources: MS 945, 37-8; OSL Galway I (1838), 260. This was really a great day. I felt elated when I was driving back to Helen’s over small, narrow roads. One of the most interesting parts of my experience in Ireland is that I have to depend on the local people, and invariably they are friendly and so very helpful. If they can’t help me themselves, they try to find someone who can. I am impressed too by the individuals who keep the regional history – both in print form and in their memories. They themselves are treasures. The above text is a product of my memory, my research materials, and my journal entry for June 29, 2007. Two years later I was in the Woodlawn area again and called Celsus and arranged to stop by his house. I arrived in the area a bit before the time we had arranged to meet so I went to the graveyard and over to the group of trees that Celsus and I had assumed was the location of the holy well two years ago. I saw that the area looked slightly different, a bit trimmed up and someone had put up fencing to surround the little tract of land to keep cattle out. I was a bit mystified; however, later Celsus said that he and a group of local people had gotten together and had cleaned the site up a bit, all because I had asked about it two years ago!! An anthropologist has been called in to assist the local heritage group and is trying to verify the well’s name – it may be St. Ann’s. I can’t help wondering if the name given in MacNeill’s article, which is St. Laan, might be seen as a variation of St. Ann in today’s research efforts; but that seems in direct conflict with the name and connection to St. Patrick’s household posed by O’Donovan. I must admit that I was flattered that my inquiry, and no doubt Celsus’ enthusiasm, had started some sort of conservation effort. I met with Celsus and his wife Mary and we enjoyed a meal together along with Christopher, their son, and Margaret, their daughter. After we ate, Celsus wanted to drive me around to see some of the local sights. By now it is almost 9 pm and I’m thinking I need to get started driving back to Helen’s. But Celsus was so excited, and it stays light very late in the summer, so we got in his car and began the tour. First we went to the Ashtown Mausoleum, but preliminary to that we stopped to get the key from Michael Daly, a very nice man who is also interested in local history; he even wanted to go with us so the three of us took off. The family name connected with this area was Trench. When I got home I did some research on the Internet and I see that the First Baron Ashtown, Frederick Trench, died in 1840. Of particular interest is an Internet site called “Abandoned Ireland”; this is a personal project by Tarquin Blake who began this photographic archive in June 2008. His idea is to record information on these crumbling Irish estates before they are lost completely. There is a sizable section about Woodlawn House with extensive photographs both inside the main house and also photographs of out buildings. To access the particular part of the website on Woodlawn the URL is <http://www.abandonedireland.com/wl.html> Although the house is in a ruinous state, the photographer managed to get some great photos and was able to chronicle quite a lot of the building. Blake states on his website that he obtains permission from the owners before he goes into private property. Just seeing his photos made me wonder how he was able to get around inside the house without falling through the rotting floors. What a house! 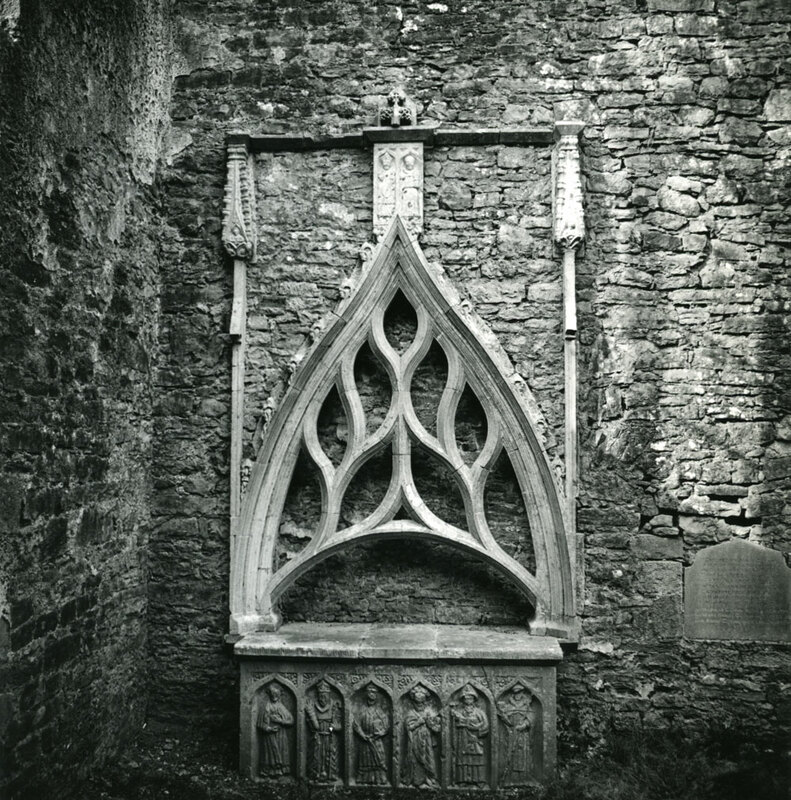 Blake has published several print volumes, for sale online, in which he shares his research and photographs. He certainly has done some interesting research. We also drove down “The Golden Mile”; this appellation refers to a competition similar to the Tidy Towns scheme. However, where Tidy Towns relates to villages and towns, “The Golden Mile” relates to areas of the countryside; it is an award designed to spark local interest in area heritage. The mile tour of an area highlights points of interest and plaques/signs are scattered along the way describing what a particular item is and why it was, or is, important. Here “The Golden Mile” seems to be, not surprisingly, centered around the Ashtown Estate. Some of the labeled ruins include Woodlawn House itself from a distance, the stables, the romantic White Bridge, the Ice-house, the Gardener’s Cottage, etc. Very interesting. We also saw some other sites such as the railroad station and the many buildings that were associated with the railroad. Celsus showed me the stone house in which his father was born. Both Celsus and Michael Daly are very good friends and obviously are in love with their area and its rich history. How very fortunate I was to find these helpful and enthusiastic people. Here again, the day was spent with interesting, friendly people who with pride and generosity shared with me their unique historical sites and landscape. I am in their debt. The above text is a product of my memory, my research materials, and my journal entry for June 26, 2009. Mary LaBarge is a research librarian at Moorpark College, a post-secondary school located northwest of Los Angeles in Southern California. She became interested in holy wells when, traveling for the first time in Ireland in 1994, she saw a finger-sign pointing out St. Moling’s Holy Well in Mullinakill, County Kilkenny. After that first serendipitous discovery, she has continued her search for sacred water sources in Cornwall, England and in Wales; but it is in Ireland that her soul lies. Since 2001 she has come to Ireland for five weeks each summer and has travelled around the rural landscape pursuing her search for sacred wells and sacred sites in general. She has a BA in Religious Studies from the University of California in Santa Barbara and she brings that background to bear as she chronicles her observations of the physical aspects of the wells and the religious traditions, symbols, and religious/Catholic practices associated with these spiritual places. She also listens to and notes stories and memories told her by local people who knew the wells when they were considered an important aspect of religious practice. She spends considerable time speaking with and listening to local people while sitting at kitchen tables sipping cups of hot, Irish tea. She also has a BA in Mathematics from UCSB and teaches algebra at the college where she works as a teacher/researcher/librarian. This page was added on 12/01/2018.